When it comes to establishing trust, it doesn’t matter how compelling your calls-to-action are, how engaging your content is, or how quickly your pages load on mobile screens. If visitors to your site have any doubts about how trustworthy you are, they’ll bounce right out and never come back. Especially in the B2B sector, where the customer journey is increasingly self-service and often involves several months of careful deliberation, trust is a deal-breaking prerequisite for any sort of relationship building process. For B2B buyers to be open to engaging with you, they need to feel confident that you’ve got their best interests in mind for the long haul. People’s guards go up when it comes to marketing and sales, simply because there have been too many cases of high-pressure, exploitative tactics over the generations. 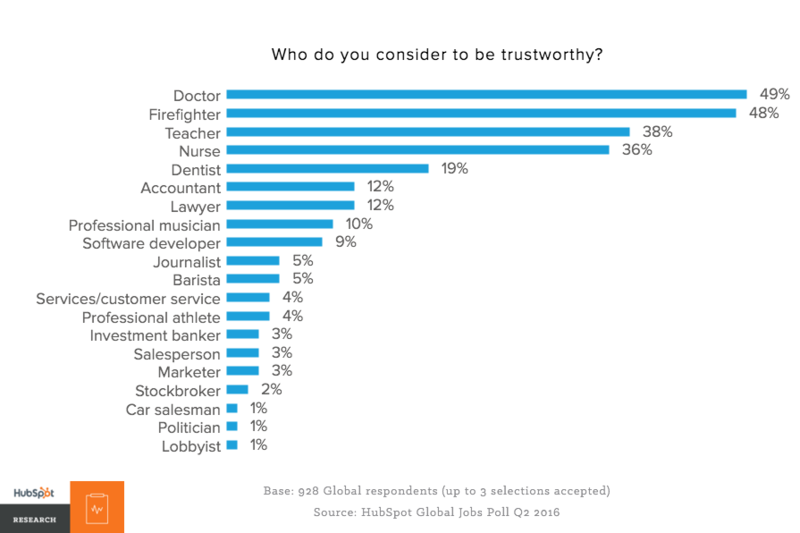 In fact, while nearly half of us trust doctors and firefighters, only 3% trust salespeople and marketers, according to a new HubSpot Research study. What’s more, our profession barely outranks stockbrokers, car salespeople, and politicians when it comes to trust. Even lawyers and baristas command more trust than we do. If you asked your customers -- both existing and potential -- to answer this questions, what would their responses look like? This question serves as the basis for a metric known as net promotor score, or NPS. And it's incredibly important for marketers to keep a pulse on. Those who respond with a score of 9 or 10 are considered loyal enthusiasts, or promoters, who are likely to fuel your growth through continued purchases and referrals. Those who respond with a score of 7 or 8 are considered passives. They are satisfied, but they’re also going to be open to offers from your competitors. Those with a score falling anywhere from 0 to 6 are considered detractors. They are relatively unhappy customers who risk damaging your brand and harm your growth through negative word-of-mouth. You can now arrive at your NPS by simply subtracting the percentage of detractors from the percentage of promoters. So if your entire roster of clients consists of detractors, your NPS is -100, and if they’re all promoters, your NPS is 100. Your NPS is, of course, strongly linked to your perceived trustworthiness. Customers who trust your business are more likely to be promoters, and those who don’t trust you are much more likely to be detractors. If you have a higher NPS than your competitors, then your marketing is more likely to yield results, too. What kinds of brands do your customers trust most? A quick perusal of Alignable's SMB Trust Index -- a report based on 7,500 ratings across 45 different SMB brands according to local business owners -- reveals some interesting patterns. For example, apparently small business owners deem Facebook (NPS 25) to be more trustworthy than LinkedIn (NPS 0). 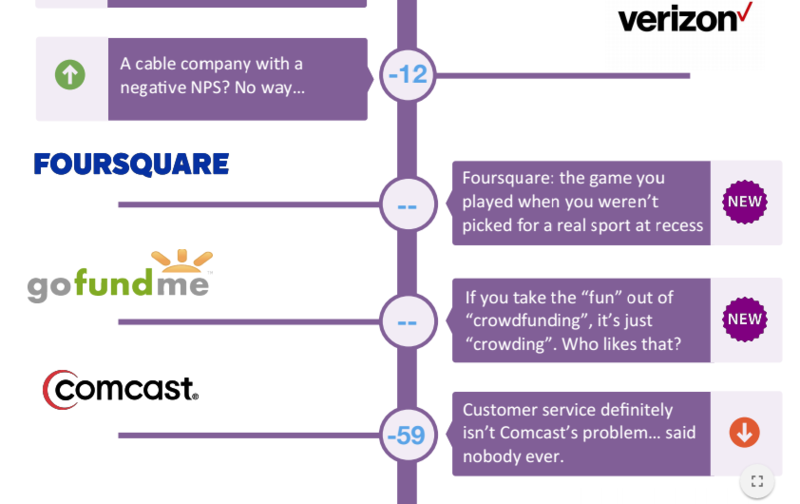 Verizon (NPS -12) over Comcast (NPS -59). QuickBooks (NPS 31) over FreshBooks (NPS 14). What is it about these brands that makes one competitor more trustworthy than another? The data doesn’t offer any definitive answers, but there are plenty of measures you can take right now to maximize the impression of trustworthiness that your website exudes. Here are seven tactics to try. Horribly generic and formulaic stock photos are everywhere. While there’s nothing wrong with using carefully curated stock imagery in the right places, it’s much better to favor website visuals that look like they were actually taken of you and your team in real situations. Stock photos can get expensive, too. To truly maximize your site’s visual authenticity, you may want to consider hiring a professional photographer to take photos of your staff, products, and office. This way, you still get quality that will display well on your website and work well for other content assets, but authenticity will shine through to your audience. Death to Stock. Check out this resources for themed monthly downloadable photo packs and “maker” movement ethos. Unsplash. 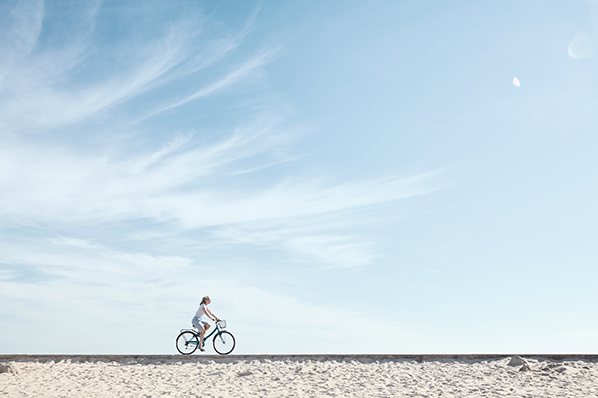 Look here for highly curated images that favor elegant still lives and serenely stark landscapes. 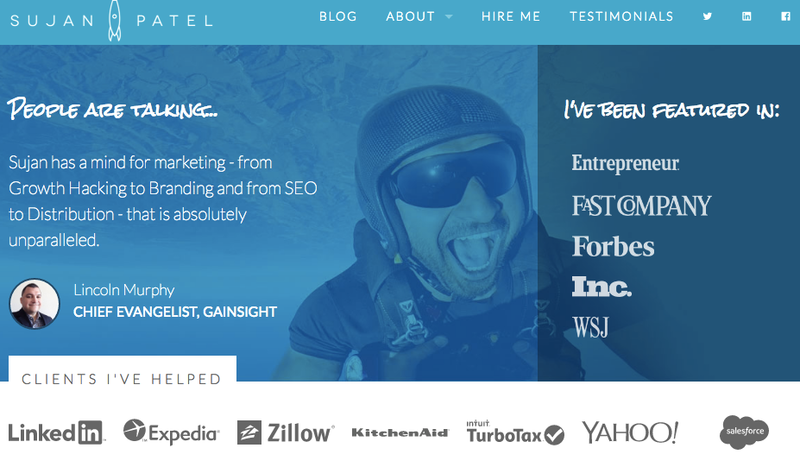 2) Provide social proof via testimonials. Social proof plays a big role in creating trust. Reach out to your clients every time you complete a project and ask them to provide feedback for display on your website. 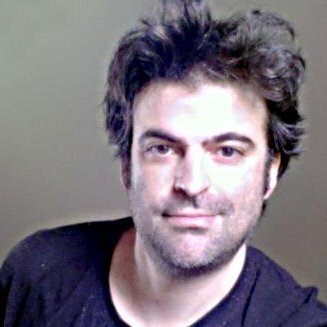 Whenever possible, include a photo of the person, which helps to drive home the authenticity to the testimonial. 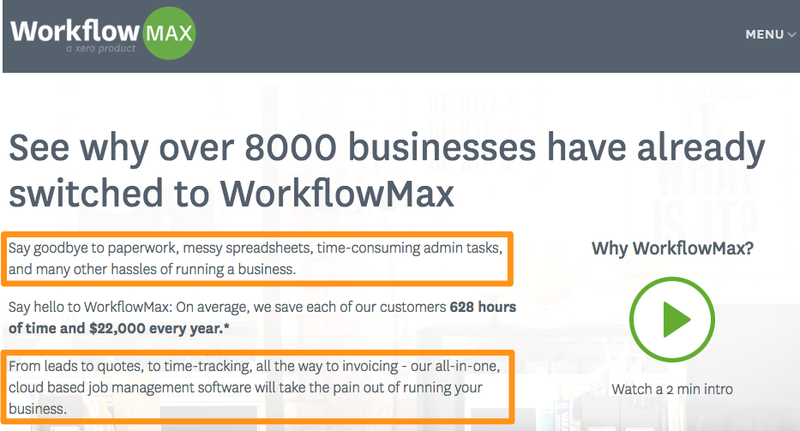 Here’s an example of a visually compelling testimonial from the homepage of Sisense, a leading business intelligence software provider. 3) Create helpful content resources. No one likes a constant sales pitch, and most visitors won’t be anywhere near ready to buy the first time they visit your website, anyway. Instead of content that screams, Buy these products now, because they’re the most awesome things ever!, aim to publish resources that show the benefit of your product or service, without overtly selling. Creating helpful content, designed to help solve audience problems and address their pain points, is critical when building trust. Many of your prospects will be looking for the same information, so use your website to provide it to them. Use your blog to explore the issues that matter most to your buyer personas and to showcase interesting ways to use your solutions. Share case studies to demonstrate how your other clients and customers have benefited from your offering to solve their issues. 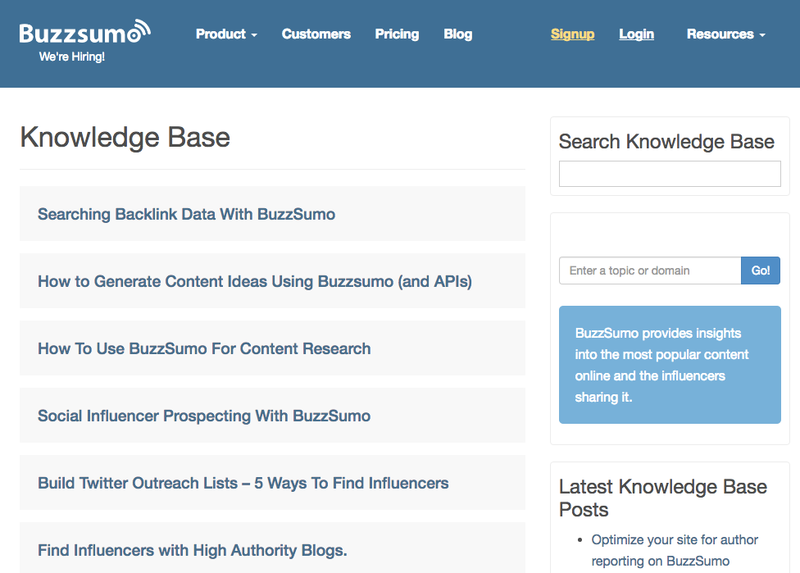 Build a knowledge base to help your customers succeed. 4) Provide social proof via media logos. Earned media commands more trust than messages on paid or owned properties. Sure, we all know that in the age of “native advertising,” the lines between journalism and sponsored promotions have blurred, but there’s still a certain mystique in being able to say that The Washington Post, for example, has found your company noteworthy enough to mention it in an article. Those “as seen on” montages of publisher logos that you see on many B2B websites are great for boosting confidence at a glance. Are you getting any decent press? Make sure your website visitors know about it. Below we can see the power of media logos in a screenshot from entrepreneur John Rampton’s website. 5) Provide social proof via client and partner logos. We’ve already touched on how important social proof is, but the opportunities here extend well beyond testimonials and media logos. You can also use client and partner logos to show who your allies are. People will recognize larger brands, but even unknowns can make an impression. 6) Include microcopy that sets expectations intuitively. Behind all mistrust is fear of the unknown. Make it abundantly clear to your site visitors what’s going to happen when they click on your site’s various tabs, CTA buttons, and links. And make sure your navigation labels are extremely intuitive. Quick disclaimers and labels below buttons are useful, too. If a prospect chooses to opt in to your email list, how often should they expect to hear from you? Will you sell them out to a telemarketing agency, or will you keep their contact information under wraps? When the experience of interfacing with your business matches what you say it’ll be -- a button takes people where you said it would and you email them only as often as you pledged to, for example -- people will allow themselves to trust what you have to say. Below is a prime example of trust-amplifying, expectation-managing microcopy from the newsletter signup page of inbound marketing agency IMPACT Branding & Design. 7) Put the audience in the center of stories you tell. When you write content, or have someone write your content for you, make sure to use the word “you.” It works as a placeholder for the reader’s name, which helps to disarm people and help them be more receptive to your message. Research suggests that some people were more likely to marry someone with the same initials as them -- that’s how powerful your name is. On the other hand, using a person’s name too much comes off as creepy, so you have to be careful with it. “You” places the reader in your content as if you are speaking directly to them and involving them, without the risks of using their name too much. This principle extends well beyond word choice. Instead of turning people off by making your content all about your company and its solutions, publish stories of empowerment where the audience is the hero. 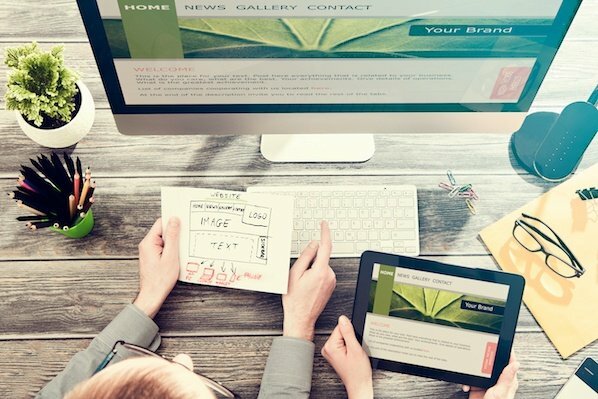 Build your website and other brand presences with these tips in mind, and you’ll have a leg up on building customer trust. By amping up on your company’s credibility, your visitors will feel safe engaging with you. How do you inspire trust on your website? Share your tips and tricks in the comments below.